This is an ancient custom in which the evil spirits are driven out of the orchards and the good spirits are sweetened so that they might produce a good crop of apples for the cider in the coming year. This custom basically involves drinking to the health of the apple trees! Villagers gather round the trees and make a lot of noise to wake the sleeping tree spirit so that it would scare off the demons that might cause a poor harvest. The biggest and best tree is selected and cider is poured over its roots. This hopefully ensures a good crop for the coming year. Jan 17th, old Twelfth Night is the traditional date for Wassailing. However, today Wassailing events occur all across mostly Southern England the first and second Saturday of January. Twelfth Night (5th January) is when all Christmas decorations should be taken down by, in order to keep bad luck from the home. In pre-Christian times, people decorated their houses with greenery to provide a safe haven for the tree-spirits during the darkest, harshest winter days. Protecting the tree-spirits like this hopefully meant the tree spirits would protect them through the rest of the year. However, if the greenery was left inside to long past the this time, the trees would not be able to start growing again and spring would not return, no crops would grow, and there would be no food. A similar belief that either evolved out of the this or alongside, was that if you left the greenery in the house the tree-spirits would grow restless and cause mischief until released. In some places Twelfth Night is also a celebration of the New Year, mixing ancient Midwinter seasonal customs with contemporary festivity. Bankside by Shakespeare’s Globe, in London. It is free, accessible to all and happens whatever the weather. In the 14th century, Lady de Mowbray, wife of a local landowner, John De Mowbray, was out riding on a hill near Haxey. As she rode across the hill the wind caught her silk riding hood and blew it away. Thirteen farm workers in the field chased the hood all across the field. One of the workers finally caught it but he was too shy to hand it back to the Lady, so he passed it to another man who then handed it to the Lady. The Lady was to touched by the attempt to retrieve her hood that donated 13 acres of land to the commoners on condition that the chase for the hood would be re-enacted each year. This re-enactment has become known as ‘The Haxey Hood’. The story is very likely true. John De Mowbray (29 November 1310 – 4 October 1361), the 3rd Baron Mowbray of Axholme, was most likely the husband of the lady. And in 1359, the baron enacted a deed granting land to commoners. This would make the Hood around 650 years old, making it the oldest surviving tradition in England. This is a church tradition that can be found across Great Britain. Larger events take place at Chichester and Exeter on the first Sunday after 6th January. Local tradesmen and farm workers bring their tools and farmers bring seed corn to church for the blessing. Molly dancing is performed on or around Plough Monday and is more common in East Anglia. Molly dancers sometimes accompanied the ploughmen to dance and entertain for money. They disguised themselves so they could not be recognised by their future employers. The dances are still performed today. Fenland skating dates back to the Middle Ages and not well known because the right conditions for skating on the Fens only happen every now and then. A Burns Supper is a celebration of the life and poetry of the poet Robert Burns, author of many Scots poems including Auld Lang Syne, the traditional New Years Eve song. A Burns Supper is normally held on the poet’s birthday, 25 January or the nearest weekend. Burns suppers are most common in Scotland, but are held anywhere Scots live as an example of national pride. Lovers of Burns’ poetry will also hold Burns Suppers. The first suppers were held by Burns’ friends on the anniversary of his death, 21 July, then moved to the date of his birth and have been held ever since. The suppers include haggis and whisky and a poem or two may be read. The largest fire festival in Europe, Up Helly Aa is celebrated on the last Tuesday of January every year. 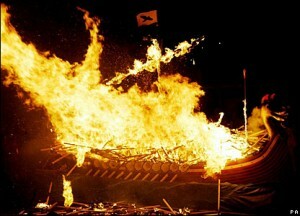 After a torch light procession through the streets of Lerwick, a full size replica Viking longship is burned. Afterwards, the local halls are filed with dancing and parties. This tradition traces its roots back to the Viking influence in the Shetlands. I was worried that you were going to miss out Burns night – but you didn’t. A friend of mine has been commissioned to write Folklore books – so it is obviously a popular genre. Couldn’t miss Burns Night! Your friend has an interesting job then, this is indeed a popular subject.